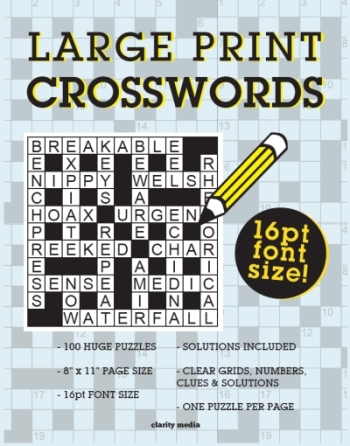 Welcome to this brilliant collection of 100 large print crossword puzzles! 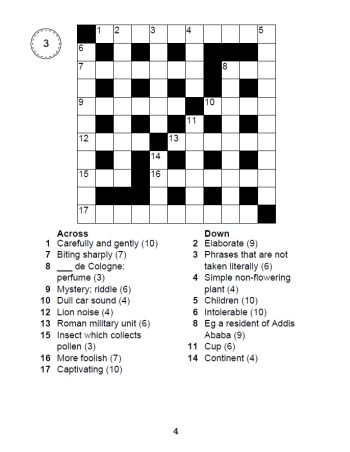 Are you a fan of crosswords, but looking for some puzzles that are easier on the eye? If the answer is yes, then look no further than this collection of 100 brand-new crosswords. Our large print puzzles solve just like a standard crossword puzzle, with the following differences: - All clue numbers in every grid are in large print, so there is no need to squint at tiny numbers in the grid - All clues are in large print - All solution grids are printed in large print If you currently solve crossword puzzles by using a magnifying glass or other visual enhancement aid to make the print larger, we hope you will find the font size large enough with our large print crossword book to make this unnecessary, allowing you to enjoy the puzzling experience even more so than usual! Solutions appear at the back of the book. A note to puzzlers in the USA or who use US English: this puzzle book was created in the UK therefore uses British spelling. Additionally some clues may be tricky to answer outside the UK if they refer to sports such as cricket or local celebrities. If buying from outside the UK, therefore, you may occasionally need to look up the odd answer at the back or research it on the internet. Will I be able to clearly read the numbers & letters in the puzzles? We realise there is nothing more frustrating than buying a book only to find out that the print size isn't what you were hoping for. Therefore please click the link above to 'large print crossowrds sample' to see a sample 2 pages in PDF format. We recommend printing off the page so you can see exactly what size the grid is printed at, and then see if the visibility of the puzzles is suitable for your requirements. Please note: it is important to print the page at 100% without any scaling if your printer has various other options to ensure that you print it at the same size as it will appear in the book: or if you don't have a printer, view at 100% in your PDF viewer to ensure you view it at the current size. Do you have other large print puzzle books available? Yes indeed we do - take a look in the left-hand menu or on the homepage and you'll see that several books are prefixed with 'large print' such as sudoku, wordsearch, code words and numbersearch. If you can't find what you're looking for, we are more than happy to help. Just let us know!